For noen uker siden fortalte vi om en ny tribute-plate til John Prine, med utgivelse i slutten av juni. En måned tidligere, med amerikansk utgivelse 25.mai kommer et nytt livealbum med Prine, »In Person & on Stage« (Oh Boy records). Her har Prine med seg følgende på scena: Emmylou Harris, Iris DeMent, Josh Ritter, Sara Watkins og trioen Kane, Welch & Kaplin. Here is the ultimate collector's boxed set for the new John Prine live album »In Person & On Stage,« which are limited editions of 300. 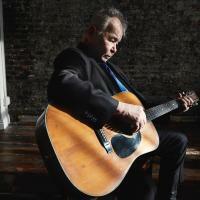 They all will include an autograph from John Prine, as well as a hand-numbered certificate. Each set contains a commemorative 8 inches by 11.5 inches setlist print which are printed with John's actual handwriting and display the album tracklisting All 300 of these will actually be autographed by John Prine himself.